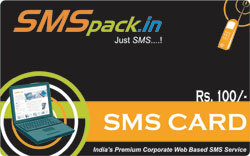 Pricing - SMSpack.in - Just SMS...! SMSpack.in - The most economical web based SMS service...! To use our services you need to have credits added to your SMSpack.in account. You can either use your credit card to purchase any of the below mentioned packs or you can use pre-paid cards available at various leading stores. If you are not a registered user Click here to Sign Up for your personalised SMSpack.in account. Note: We accept all Master, VISA credit cards and ICICI, UTI Net banking.